When we were 19 and nine months into our marriage, we were thrilled to find out we were expecting our daughter, Lynzie. 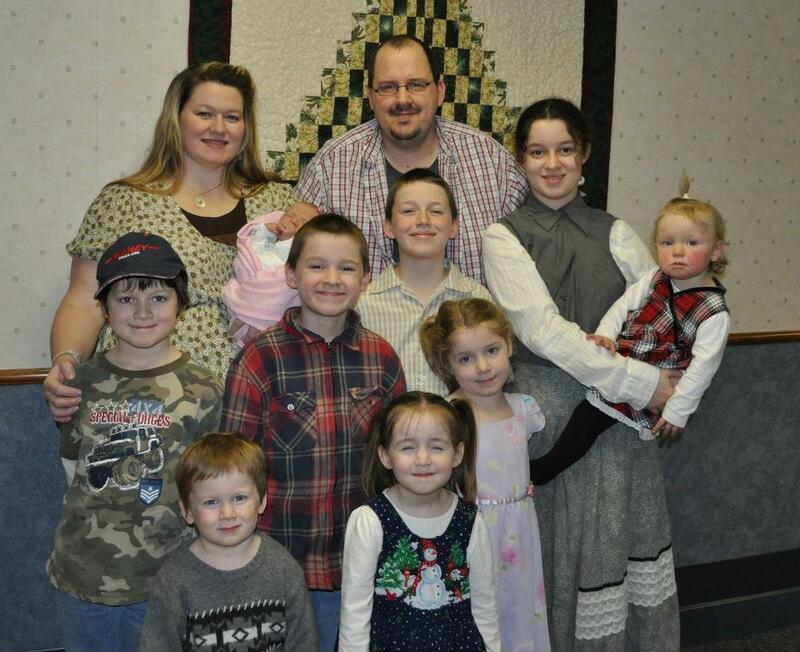 Almost 15 years later, we've been blessed with nine children and a beautiful life. The only downside I can think of to having a large family is the cost involved---and even that's not so bad with the right planning! I have been a Wells Fargo customer for several years, but it's only recently that I've discovered some of their online financial tools. 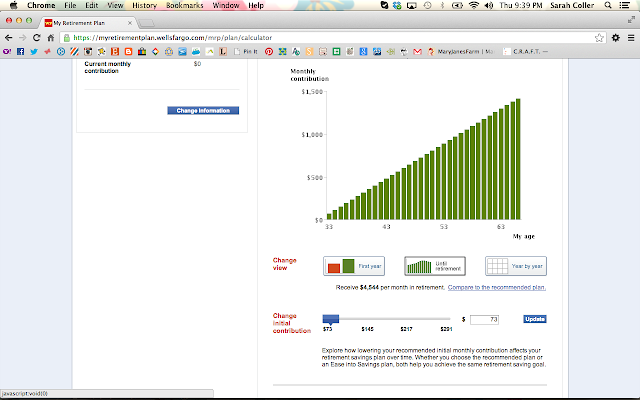 In the past, I've never gone further than monitoring my checking account and doing a little online bill paying. This past week, I've had fun buzzing around their website and seeing the different options they've made available to help Jamie and I keep our finances in order. 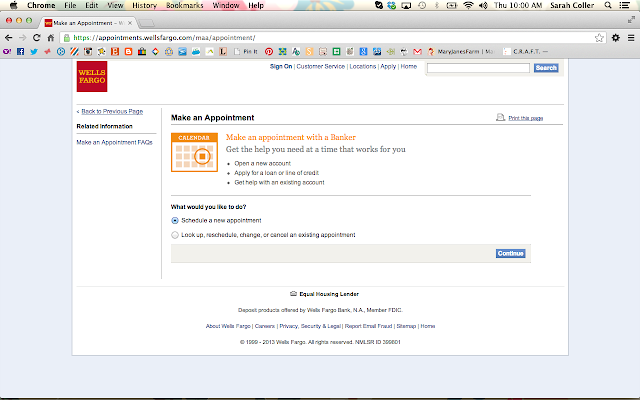 How neat it was to find the option to make an appointment with a Banker online. The process of making an online appointment was very simple and so convenient! With my busy life at home, I don't get the opportunity to get out to many daytime appointments. I wish more businesses would provide an option for an online consultation like this. About seven years into our marriage, Jamie decided to go back to school and his first loans were through Wells Fargo. In fact, that's what led us to switch banks, as we wanted all financial stuff in one place. Wells Fargo has online planning tools and calculators to help students and parents make good decisions regarding student loans. Loans can be applied for and managed online, and there are lots of links to great information for the whole process. Another great financial tool Wells Fargo offers online is called, My Retirement Plan. No matter how deep I bury my head in the sand, aging is something I just can't avoid! It's important that adults of all ages be prepared for retirement. This easy tool helps you do just that. 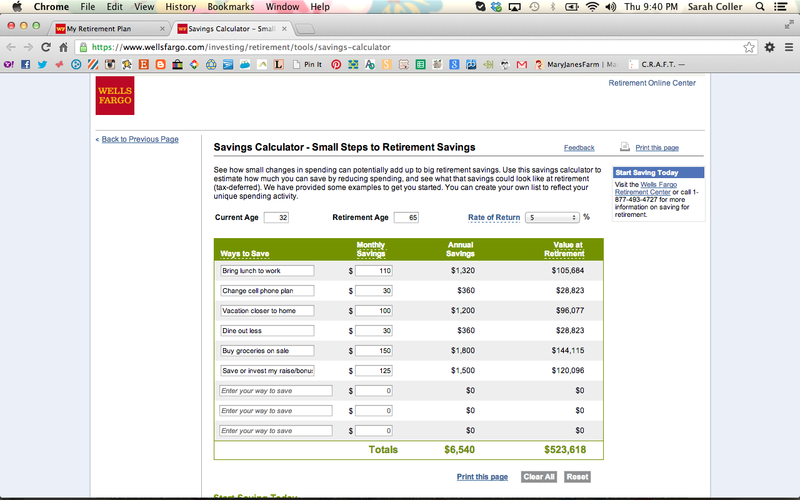 Notice at the bottom left of the screenshot there is a column titled, Saving for Retirement. Just click the link for your current age to get started. People in their 30s (like me) are getting settled into a career and looking to put down some roots. 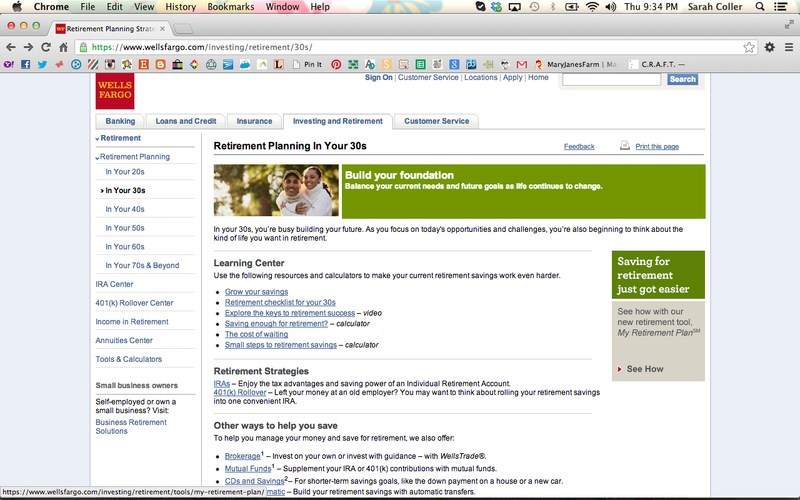 This page provides information on several topics that are important to younger adults thinking about retirement. I was interested in the My Retirement Plan tool that was advertised in the box on the right, so that's where I went next. My Retirement Plan sets up a tailor-made plan for the customer, based on answers to a few short questions. It took me just a couple of minutes to complete. My current monthly contribution to retirement savings is $0. 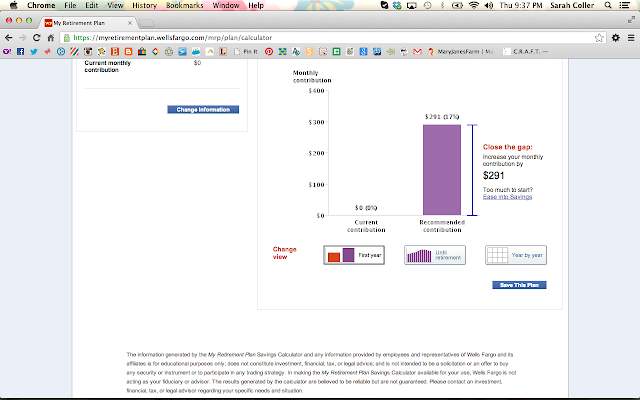 Wells Fargo recommended I begin my savings at $291 per month. That figure did seem a little overwhelming to me to begin with. Luckily, there is the option to ease into savings. See the link there on the right? 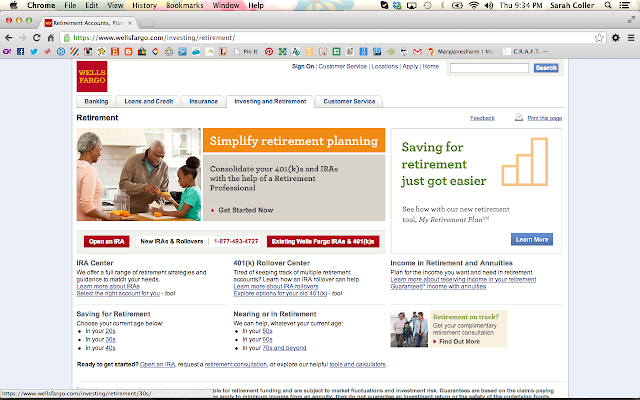 I clicked it to see what options Wells Fargo could provide me with for an easier beginning savings plan. If I start out only saving $73 per month, in 10 years I'd need to be saving as much as $500 per month! Even more 10 years after that! I think I better start with a little bit higher of a number. 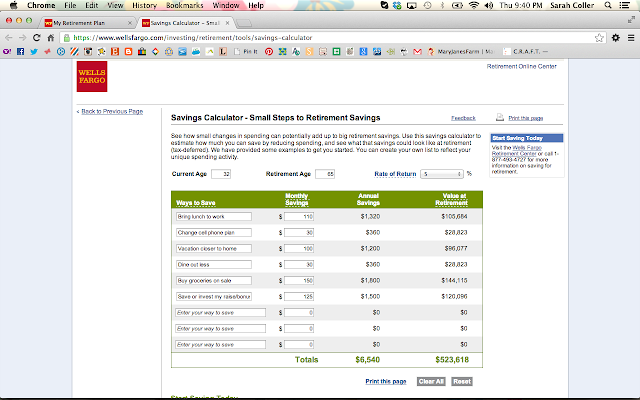 A savings calculator was also provided to help me come up with ideas for saving a little here and there to add to retirement. These are great ideas and there's even room to enter my own. I really appreciate this useful tool and feel like I have a lot of great resources right here to help me better plan for my future. To read about my experience in more detail, please visit my Google+ album. I really appreciate Wells Fargo partnering with our family to help us prepare for every stage of our lives. It's comforting to know that someone more knowledgeable than us about finances is helping us to make good decisions. I am a member of the Collective Bias™ Social Fabric® Community. This content has been compensated as part of a social shopper insights study for Collective Bias®. #CBias #SocialFabric All opinions are honest and are my own.